The Finding Nevis Tours are led by Ms. Pam Barry. A Nevis treasure in herself, Pam is an avian connoisseur, historian, storyteller, and Nevis resident of nearly 50 years. The tours are arranged to provide a variety of interests from bird spotting to glimpses into the amazing history of Nevis Island. Review each of the tours above to see which one may include activities that will ensure you “Find Nevis” in your own special way. If you have a limited amount of time, a particular interest, or any other special requests, let us know. We can work with you and your party to make sure you Find Nevis in a way you will remember. Our rates vary between $30 and $50 US per person depending on the duration, any venue admission fees and the number of guests. At this time all fees should be paid in cash. Golden Rock is the Inn that your guide Pam Barry used to own and run for over 37 years. The new owner Helen Marden has created an extensive garden designed by Raymond Jungles that attracts many different birds and butterflies. Pam will also give you a tour of the sugar estates’ interesting stone buildings built during the years 1801 to 1815. There will be stories about Pam’s family, how they first built the sugar plantation and how the sugar process worked. If you are interested in the plants and trees in the gardens she will identify many of them for you. There is a great mixture of history, flora, birds and views which is why we recommend a stop at Golden Rock for everyone. There are many great photo opportunities so bring your best camera. This tour is for people specifically interested in Nevis History. There was a lot going on for such a small Island back in the day when they were building Charlestown, growing sugar and fighting with the French. Pam will reveal this history for you with visits to the Nelson museum and Alexander Hamilton museum as well as Fort Charles, plus several other interesting historical spots in Charlestown while she peppers stories of local lore, island characters and events as you travel along on your tour Finding Nevis. This Garden Tour is recommended for all garden lovers who are visiting Nevis, even if you are just here for the day. Pam will accompany you to the Botanical Garden, the Golden Rock Inn and the Heritage Village. Pam enjoys showing you some of her favorite trees along the way that are in bloom during the year. Just a few are called the Baobab, Flamboyant, Neem, Silk Cotton and Strangler Fig trees. We recommend Snirdturling in the afternoon in a picturesque spot just North of the Pinneys Beach restaurant area. Pam will swim you out to the breakwater walls just off the 4 Seasons Hotel where you often find a turtle to swim with and large schools of anchovies that swirl around you. It is like being in your own aquarium at a spot that is so close to the shore line. The recommended time is 4:30 pm. You will enjoy the sea birds gathering on the top of the seawalls. Upon returning to the beach you may even spot a flitting Yellow Warbler or Viero bird in trees. To complete your Snirdtuling adventure, it may be time to have a drink at one of the great beach bars to watch for the green flash as the sun goes down but if you are hungry she will happily recommend one of the many wonderful culinary experiences you can Find in Nevis. For birdwatchers who are really interested in the birds of Nevis we can add a little more bird watching and of course still search for the green flash at sunset. You are invited on a tour of the Village of Rawlins. It could be in the morning or afternoon. But the best day is Sunday at about 11:00 am so you can taste a warm whole wheat roll mixed with shredded carrot and coconut baked by Rasta Bob in his backyard. They are really healthy and delicious. Pam will guide you through the village and point out some of the colorful aspects of island life. You will see plenty of birds, donkeys and monkeys as you wander through this quintessential Nevisian setting. Pam’s home is very nearby and you are welcome to visit. Pam will introduce you to a wonderful collection of small gift shops so you can Find Nevis Treasures to carry home. It is best to begin in the morning after breakfast and end with a Nevis style lunch. She will be happy to recommend several different restaurants. Bring your credit card but also some cash. Some of the small local shops are not able to accept credit cards. Pam will ensure you find interesting treasures as you meet the local Nevis potters, wood workers, artists and craft persons. While she tours you around the island you will get the extra treat of experiencing many breathtaking ocean views and you get to see some of the backside of Nevis. Above the 4 Seasons Hotel are the ruins of a beautiful old sugar plantation called Mountravers Estate where Pam’s family built 6 lava stone buildings. They resided there until 1900. She will share with you her photos of the buildings taken in 1939 to show what the estate looked like back in those days. You can choose a long or short walk to the Estate. The long one is more interesting if you are up for a bit of uphill walking. The ruins and view of Pinneys Beach below are well worth it. The shorter trail takes you over a small dam and then on to the ruins. Neither one is very difficult. There is also bird nesting area nearby to see. Best time for this is 4:30 to 6:00 pm. If you prefer to do some shopping at the Artisans Village then we must go from Monday to Friday between 9:30 to 2:30 pm to be sure that most of the local artisans are there. This Architectural Tour is arranged so that Pam shows you around Charlestown where you will learn about the Georgian architecture as you walk the narrow streets and back roads of this quaint centuries old town. You will learn how they built the buildings and what local ingredients were used to construct them. Then you will visit the New River Steam Boiling Estate and just below is the Coconut Walk Lime Kiln. 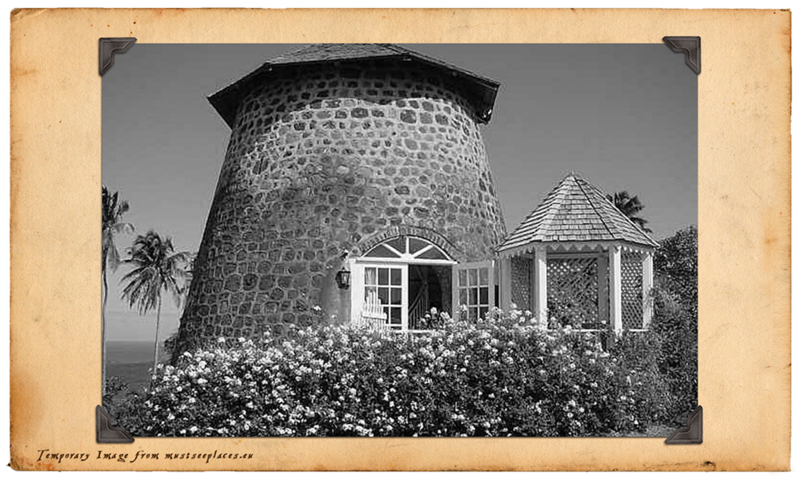 There you will see one of the largest bee hives on the island located in one of the best preserved sugar mills built by Pam's ancestor. She will even help you in Finding Nevis Carib Indian pottery shards along the water's edge. Pam will take you for a beach and mangrove experience. Her favorite spot is the pond between Christi and Gateway restaurants where you will find various kinds of Egrets, Herons and the neon sign Moorhen Ducks. You will be sitting on the beach from about 4:30 pm to sunset. Please bring along a sleeved shirt and long pants just in case the bugs are active. You will also observe the Sea birds such as the Pelican, Laughing Gull, Frigate Bird, Brown Booby, Spotted Sandpiper, CommonTern, and maybe an Osprey will fly by as the sun is setting. Get ready to try to see the green flash as the sun dips down, but you only see it if there are no clouds on the horizon. Anyone for a drink at a nearby beach bar to celebrate your days success? This is the best Garden Bird Watching spot where Bullfinch, Bananaquit, Zenaida Dove, Pearly Eyed Thrasher, Antillean Crested Hummingbird, Kingbird, Red Tailed Hawk and the smaller Kestrel are found in the beautifully landscaped Inn called Golden Rock. Here Pam will regale you with stories about bird experiences and all about the old sugar plantation buildings and how sugar was made. If you are garden lovers she can help identify the plants and trees where you are spotting different kinds of birds. This another favorite because of her family ties. You will be located at the mouth of the Hot Spring water and the Caribbean sea. We will park by the Gallows Beach and look for the Snowy Egret, the Yellow Crowned Night Heron, the Cattle Egret in his pink neck plumage and the Little Blue Heron nesting area. Plus nearby is the Bath Plain where you may see Swifts twisting and gracefully turning to catch bugs in the air. You may see some Guinea Fowl, Kingfishers and a Peacock in full array walking around the area. This is another good spot to watch for the elusive Green Flash at about 6:30 pm. Remember there can not be any clouds on the horizon. Good Luck. For birdwatchers who really like to snorkel we can add a little more bird watching and of course the search for the green flash at sunset. Pam was born in Philadelphia, her grandfather was born in Nevis. It could be said Pam’s story began on her first evening ever on Nevis in 1963 as a fifteen year old, she and her sister Jan lay on two small twin beds conversing late at night. Pam confessed, “I don’t know about you but I want to live on Nevis”. Her sister quickly asked, “What are you going to do here?”. Pam replied, “I don’t know, I just have such a strong feeling about Nevis that I really want to live here”. Could this young girl at this tender age have uttered her destiny? She would be the family member to reconnect five generations of Huggins family history back to Nevis. It was just in her blood. The unspoiled ways of life on the island appealed to her. There were very few homes with electricity. Most men (fishermen and farmers) only had donkeys for transportation. She wanted a more simple life and the food was so fresh. You could use just a mask and snorkel to dive up some lobsters or conchs from the beach. Her life became such an adventure. It was in 1969 when she married Frank and moved to Nevis after college and after 4 years of working for American Airlines. It was still hip to be hippy so in order to put goat water soup and sour sop desert on the dinner table, they looked around at the island’s resources and noticed there were plenty of goat and sheep wandering around. So they started a small backyard business of tanning the animal skins. The messy tanning was Frank’s job. Pam took the soft and sweet smelling final product, with the help of Mella, a Nevisian, and made bags, belts, pillow covers and small piece work rugs. At that time their shop was one of only two gift shops on the island and the only sign on the road for miles. 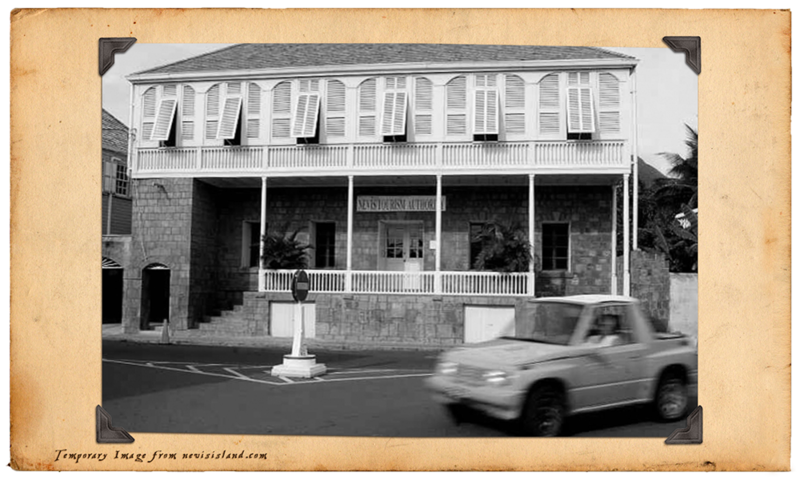 In 1975 the Barry’s invested in Golden Rock Inn, a stunningly beautiful 16 room inn on a sugar plantation with more stone buildings on property than the other four inns on Nevis. It was built by Pam's ancestor in 1801 through 1815, located 1000 feet above the shore on the edge of the rainforest where monkeys and wild donkeys reside. So naturally the grounds and surrounding area are one of her favorite guided tours. Her father’s family history did not begin at Golden Rock but rather when two Irish brothers arrived on Nevis in 1680 as trained blacksmiths to help build the newly relocated main town called Charlestown. The Huggins family lived continuously on Nevis Island until her great grandfather (the island doctor) died of a fever in 1897, then her Aunt Julia died a spinster in 1910. It isn’t surprising that Pam would want to become an owner and manager of the Golden Rock Inn. The adventure of running the small Inn lasted for 37 years, something she absolutely loved doing. A car accident, the dust settled, the two vehicles were repaired and Pam met Dane. It was out of this collision a new friendship came about with Pam and Dane. To start archery as a sport is Dane’s passion and soon became yet another passion that grabbed a hold of Pam and The St. Kitts & Nevis Archery Association was created in 2013 and continues today. If you see Pam looking down at the ground for no apparent reason please know this isn’t such a bizarre quirk of Pam’s, but rather another little passion of collecting antique china shards that can often be found on back roads and dirt footpaths on the island. Pam continues to collect them and incorporates them into some of her art work. With the many years of tending to her guests at Golden Rock Inn, it is with the same love, enthusiasm, and hospitality that she can help each one of you in “Finding Nevis” for yourself. Check back often, we hope to have our Finding Nevis items available soon.